Dr Roxna Swamy has done a great job of writing a biography on someone as varied, yet, single-minded in his approach as Dr Swamy. If you think being Subramanian Swamy is difficult, think again. Read this book. It is being Roxna Subramanian Swamy that is more difficult. 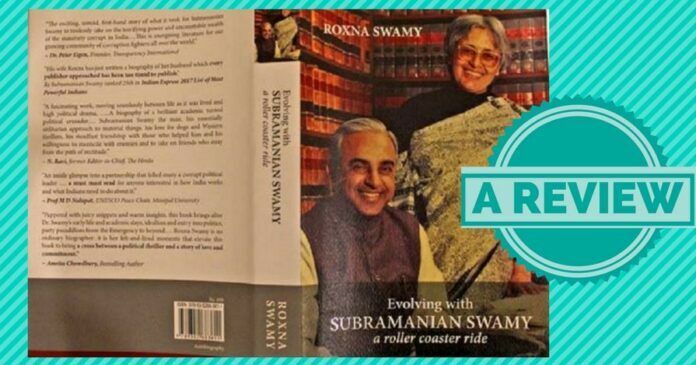 While the reader is faithfully taken on a rollercoaster ride of Swamy’s major highs and lows in life, it is Roxna Swamy who shared in his joy and remained the shock-absorber. It is difficult to write a biography. Especially, of someone as varied, yet, single-minded in his approach as Dr Swamy. Dr Roxna Swamy has done a great job. She has captured him from his early days in life to his days in Harvard, to his preparation in taking up an assignment by mastering Mandarin in a year, to his return to India and to a life that simply played out a myriad of challenges. Through all this, what strikes the reader is the amount of hardship, tension and uncertainty Roxna and her little children went through those days. Vengefully sacked from the IIT, the eviction from IIT quarters, hostile IIT officials all set to pack her and her two toddlers off, to a variety of defamation cases by Jayalalithaa, her plans to arrest Swamy by recalling a domestic flight, in which he was travelling mid-air to Bangalore, she also brings out his ability to fight opponents, yet maintain a friendship across party lines. The reader will clearly understand how Swamy remembers a help in time and returns favours to the benefactor (Dr Manmohan Singh for example). And his Twitter Philosophy- “I give as good as I get” can be seen in many events in his life as captured in the book. What strikes most is her narration of how Vajpayee or Yashwant Sinha played foul with him. Be it in the narration of the rousing reception the Chinese gave to Swamy or taking glee in the damp squib of Vajpayee’s Chinese visit thereafter, she minces no words in telling the reader what she feels about ABV. Her narration of Sinha mortgaging gold to a British Bank, without keeping the then Commerce Minister, Dr Swamy in the loop is a clean shot, straight from the hip. Swamy’s famous fights with the then darling of the liberals, the late Ramakrishna Hegde, the various cases and Hegde’s reproach to Swamy on his deathbed have all been truthfully recorded. The Emergency days. The family’s hardships. The hounding by the police. Swamy’s dramatic appearance in RS and his Houdini act, belong to the genre of Ian Fleming. How much Roxna had to go through because she continues to love this man from Harvard days! That’s the testimony of the strength of their marriage. Togetherness through five decades. Roxna Swamy gives us more than a glimpse into the source of inheritance of the couple’s righteous stubbornness. Their parents and curiously, his ancestors. Roxna’s father stood up to the might of Nehru, who called him a “hidebound bureaucrat” for disallowing Government Helicopter to a lady American Journalist who sought it from Nehru to view Bihar floods from the sky. Her father looked into Nehru’s eyes and said- “Give it to me in writing”. Thus, came the law on “cooling off period” in Civil Servant’s terms of service in taking up jobs post-retirement. Swamy is the Neo-Abhimanyu with a major difference. There is a historical genetic trait that Swamy has inherited, the source of which I never knew before. His ancestor, Sri. Ramappaiya Iyer the Dalavay or the Kattappa of the Madurai Monarch Tirumala Nayakar, who feigned deaf to the Monarch’s order to retreat in a battle against a formidable force. Iyer returned victorious for the King to change his views that were tutored by biased courtiers and welcomed him with honours and rewards. His grandfather Sitarama Iyer was a perpetual litigant. Perhaps, those genes underwent some morphing as Swamy takes up only the right issues to fight in court. Swamy is the Neo-Abhimanyu with a major difference. He knows how to pierce into the Chakravyuh and most importantly, knows how to come out of it successfully. Leaving his opponents licking their wounds. But this Neo-Abhimanyu had to contend not just with his Political opponents. He had to contend with his own people in the party and the RSS. And his fight will go on. He has been denied what should rightfully belong to him. Till then, he will stick to one of his rarely known success formulae. Hold out one’s hand and let the Heavens drop in the required article. I learnt little more about mr Swami , whom I respect for this forth right expression of his opinion on any issue. Will try to read the auto biography written by Mrs Roxana Swami. I have the read the book in full and Dr swamy has seen many ups and downs in his life..the way he faced challenges is highly thrilling,motivating and all this is possible due to his hard work,honesty and above all 100% support from Dr Roxna..a must read for today’s younger generation..
May Dr Swamy live till he’s 100+. (I’m not exactly a Swami-bakth; I don’t agree with him on all issues.) His success will lie in grooming 100 Swamys who will be as good as him (or even better), not merely millions of followers. (By this, I don’t mean to belittle his followers.) And he should let those 100 Swamys loose on the nation’s internal enemies, right now, not after him, so we may now have 100 Swamys, not just one. India is lucky to have legally, highly intelligent and patriotic people like Swamy .we wish him long healthy life. Want to know Dr swamy Just meet him once and listen to him face to face your way of life will change . He brings goodness in all whom he meets .